Spray 9x13 baking pan with baking spray. Preheat oven to 350° F. Prepare cake mix according to package directions. Stir lemon zest into batter and spread in prepared pan. Bake according to package directions. Cool cake completely on a cooling rack. In a small bowl, stir lime gelatin mix and 1 cup of boiling water together. 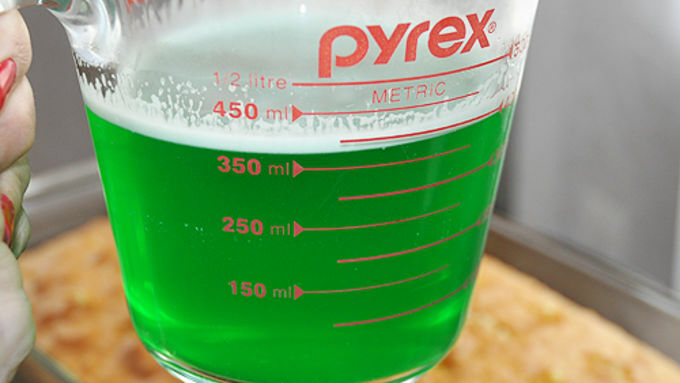 Stir until gelatin is fully dissolved. Add 1/2 cup cold water and mix. Using a fork with long tines, poke holes every inch or so all over cooled cake, poking almost to bottom of cake. Pour prepared gelatin mixture over entire cake top, allowing it to soak into the holes. Cover cake with plastic wrap and refrigerate 4 hours. Cut cake into squares and place on serving plates. Cut lemon and lime into very thin slices. 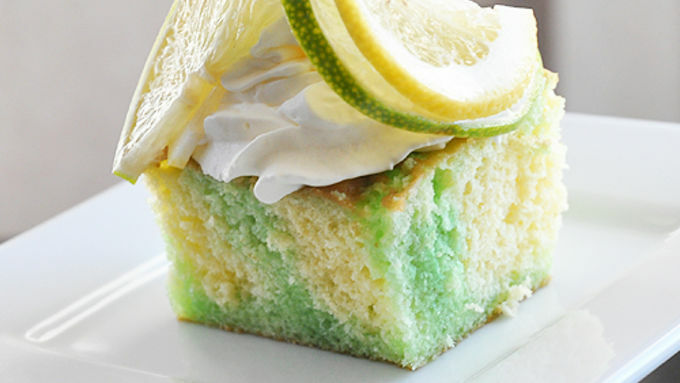 Garnish cake with whipped cream and lemon/lime slices. 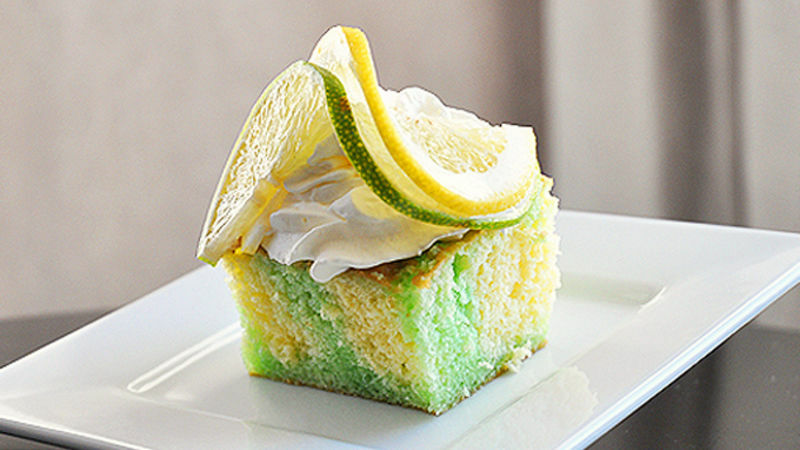 This Lemon-Lime Poke Cake is bursting with citrus flavor. Remember the good ol' poke cakes from family reunions and potlucks? Bring 'em on back -- it's time for a poke cake revival! I know you've had 'em -- red cherry or strawberry gelatin tucked into colorful pockets in a fluffy white cake. Or maybe your fam was more the orange or peach gelatin type. Poke cake recipes have been around awhile, and they're as great now as they were then, cuz they're quick, easy, versatile and even conversational. So let's bring back the poke cake! This Lemon-Lime Poke Cake recipe is the lightest tasting version of all, and it's perfect for starting a fresh new year. Swoosh on some whipped cream and then do this little restaurant garnish trick -- slit the lemon and lime slices just past the center point, put them together and twist. Brilliant! Go ahead -- chomp away. You made it -- you so deserve it! Spread the word: Poke cake's back! Celebrate the return of poke cake with some of our favorite recipes. Remember the good ol' poke cakes from family reunions and potlucks? Bring 'em on back -- it's time for a poke cake revival! I know you've had 'em -- red cherry or strawberry gelatin tucked into colorful pockets in a fluffy white cake. Or maybe your fam was more the orange or peach gelatin type. Poke cake recipes have been around awhile, and they're as great now as they were then, cuz they're quick, easy, versatile and even conversational. So let's bring back the poke cake! Make a Betty Crocker lemon cake mix according to the package directions. 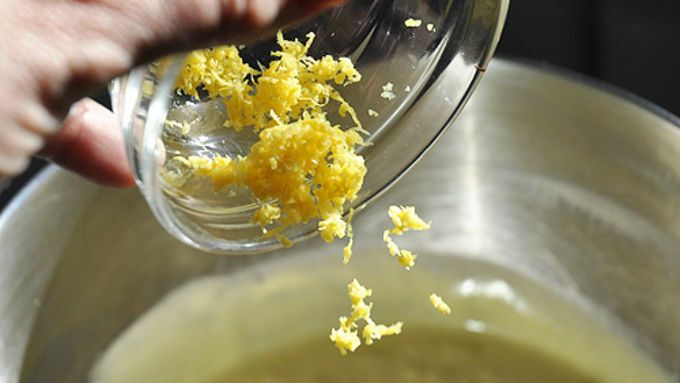 Then add a tablespoon of fresh lemon zest to the batter. Stir the zest into the batter so everybody gets some and there aren't any lemony knots. Spread the batter in a greased 9x13" pan, bake the cake and then let 'er cool. When it's fully cooled, use a fork to poke holes all over, almost all the way to the bottom. Yes, Einstein, that's why it's called a poke cake! Mix a 3 oz. box of lime gelatin with 1 cup of boiling water. Stir until the gelatin is desolved, then stir in 1/2 cup cold water. 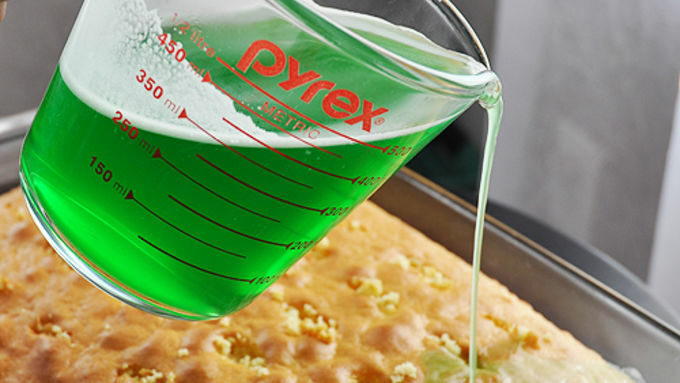 Then pour the beautiful green liquid over the poked-up cake. Now you're gettin' the idea! Cover the cake with plastic wrap and refrigerate it for 4 hours so the gelatin and cake can get to know each other. Meanwhile, cut a lemon and lime into very thin slices. When the cake is set (after 2 to 4 hours or so), cut it into squares and place them on serving plates. Swoosh on some whipped cream and then do this little restaurant garnish trick -- slit the lemon and lime slices just past the center point, put them together and twist. Brilliant! Go ahead -- chomp away. You made it -- you so deserve it! Spread the word: Poke cake's back!